“Aurora and the next generation of exascale supercomputers will apply HPC and AI technologies to areas such as cancer research, climate modeling and veterans’ health treatments. The innovative advancements that will be made with exascale will have an incredibly significant impact on our society.” — U.S. Secretary of Energy Rick Perry. The foundation of the Aurora supercomputer will be new Intel technologies designed specifically for the convergence of artificial intelligence and high-performance computing at extreme computing scale. These include a future generation of Intel® Xeon® Scalable processor, Intel’s Xe compute architecture, a future generation of Intel® Optane™ DC Persistent Memory and Intel’s One API software. 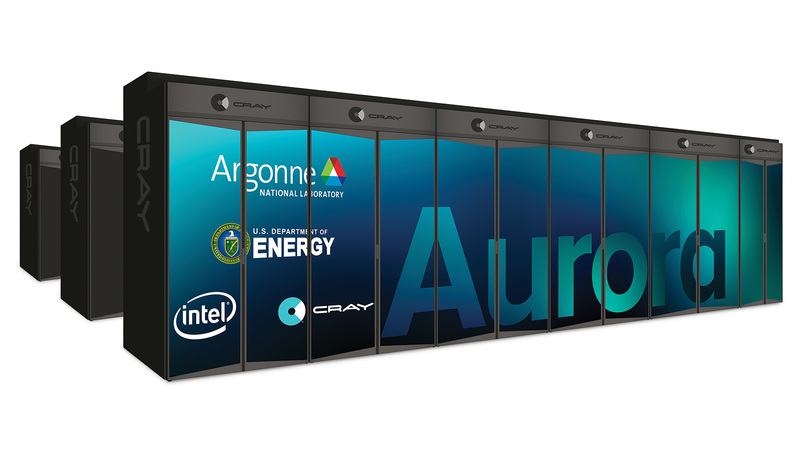 Aurora will use Cray’s next-generation supercomputer system, code-named ​“Shasta,” which will comprise more than 200 cabinets and include Cray’s Slingshot™ high-performance scalable interconnect and the Shasta software stack optimized for Intel architecture. Intel (NASDAQ: INTC), a leader in the semiconductor industry, is shaping the data-centric future with computing and communications technology that is the foundation of the world’s innovations. The company’s engineering expertise is helping address the world’s greatest challenges as well as helping secure, power and connect billions of devices and the infrastructure of the smart, connected world – from the cloud to the network to the edge and everything in between. Find more information about Intel at news​room​.intel​.com and intel​.com.